Yellow Collared Macaw Diet - How To Feed Your Pet Parrot? 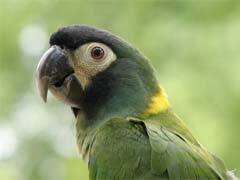 The yellow collared macaw may be the smallest of the macaw species, but they certainly are not the least fun as pets. These parrots are known to be very intelligent, and many have a personality similar to a small child. They are affectionate and, like a small child, will do just about anything to get the attention they want. The yellow collared macaw is also a great escape artist, so care should be taken when buying their cage to keep them from getting out. Talking isn’t a guarantee of any breed of bird, but these macaws are said to have a clear voice with a larger vocabulary than other macaws when and if they do speak. These traits make keeping yellow collared macaws as pets a very fulfilling choice. Macaws all have a similar diet, but the yellow collared macaw enjoys a few more nuts than their cousins. Their diet should be closely matched to the diet they would have eaten in the wild. The yellow collared macaw is a South American bird, so fruits and nuts along with larger seeds make a great diet for these birds. Keeping fresh fruits, and cleaning them up after your bird eats, isn’t always viable. Luckily pet food manufacturers make extruded pellet foods that contain many of the things exotic pet birds need in their diet. Fresh fruits should still be given as treats fairly often. Because breeds like the yellow collared and miligold macaw basically live to play, you should provide them with foods that will offer mental stimulation. Nuts are a good example and your local pet stores that have macaws for sale should also carry other treats made for this purpose. Like all birds, the yellow collared macaw will need to scrub their beak and file the end. A cuttlebone should be provided for this inside the cage, it should be placed by a perch to make it easily accessed by your parrot. Availability of certain fruits and nuts can vary depending on season and location, because of this it is best to ask local breeders or dealers what the best local foods are for parrots. Sometimes the best foods will be dehydrated fruits which can be purchased anywhere year round.